In the rearrange we decided a few well loved yarns needed to make space for some new stuff. If you loved Soleil Cotton, Balance, or SeaSong they are on sale. 20% off for skeins 1-9 and 10 skeins or more are 25% off on all. The bins are emptying quickly, so don't miss out if you loved any of those yarns. On the new front! Silky Alpaca Lace from Classic Elite (70% baby alpaca 30% silk-460yards for $11.00) has been very popular. We are thrilled with the put-up and thrilled with the price. Several new colors arrived and have the lace knitters smiling. We also added colors in Princess, Classic Silk and Pebbles. Blue Sky has added two new Dyed Cottons in multicolors. "Camo" and "Gunflint" (guess what the colors are????) are both very popular. We also added in Spud and Chloe Sweater in the newest color "Grape Jelly" and Fine in Shitake and Red Hot. Good additions to a line of yarn we really love. It may seem to the casual reader that I am completely clueless about the passage of time. However, if you know me at all you know I'm pretty meticulous about time. It doesn't typically escape me. I'm rarely late, I almost always know what day it is and can usually tell you within about 30 minutes what time it is. So the fact that another entire month has zipped past has me a little stunned. How the heck did we get to July 12 - just yesterday was only May! Of course my only excuse for the clueless passage of time, is that we are keeping mighty busy around Knitting Addiction. It has been wonderful to meet all the new people who have found us in our new location. We are working hard to learn new faces and new project preferences. It has all been a really crazy roller coaster ride. I think Britt and I are finally getting closer to keeping the inventory cushion we like. This was the first week that I went to the store room to look for a particular yarn that needed to be restocked- and amazing- there it was on the shelf- just waiting to be tagged and put out for sale. I can't tell you how many times since the move that I looked in the back room and then grilled Britt about what happened to all the yarn. I'm sure we will still manage to run out of some of the fast movers, and I won't likely ever be able to keep in all the stock I'd like to have, but we are learning the new normal and that is really cool. As promised a few pictures will grace this post! New samples are still flying off needles. I finished a really cute little girl's shrug in Pebbles by Classic Elite. Pebbles is new to us this spring. It is a cotton/ acrylic blend- knits about 5 stitches to the inch (110 yards is $5.75), washes beautifully and has been super popular since it arrived. I had to knit the Knitting Pure and Simple "Little Girl's Shrug" out of it, because I was itching to get a chance to play with it myself! The shrug is adorable- only 2 balls for the size 4 and one really cute button. The pattern is written for up to a girl's size 10. Also new and noteworthy is a cool line of acrylic buttons that we just went crazy on today. I'd checked out this person's buttons in Asheville and thought they were seriously cool- and low and behold- Gail Hughes walked in the door yesterday with a trunk full of samples and we were hooked. As you can see, they are really going to be the perfect accent for a whole bunch of cool projects. Speaking of cool projects- I have to mention a really neat young lady who brought in her "portfolio" of knitting that has been completed in the past year. Alex was a new knitter last year, came to KA with grandma Sylvia and has really found her groove. We were thrilled to see the amazing fair isle work done in the clever hands of someone who has only been knitting a year. Even more impressive is how clever the knitter is- since she is only 12! Pictures to follow. 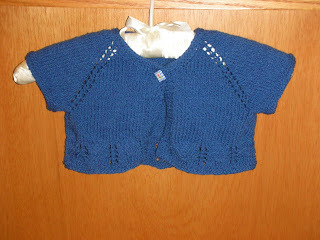 I wish all my knitters were brave enough to tackle the kind of projects Alex has skillfully completed. Knit on girl! And a final note for today, I've been thinking on it for a week, so time to write it down. The family at KA has had a sad loss in the past week. Judy Link, one of our first and favorite customers passed away last week at her home. We are all greatly saddened by Judy's passing. She has been a weekly fixture at Knitting Addiction for 6 years and many of us are feeling the empty space on the sofas. Judy was the kind of witty friend that kept us all on our toes. She was quick with a joke or clever side bar, equally quick to tell someone how pretty their knitting was and if you listened closely you could really hear the good stuff. Judy's passing has us all thinking about how important it is to let the ones you love know that you love them every day. I hope she has a little knitting on the other side to keep her hands busy. There will likely be plenty of cats to take care of and people to keep in order. Our thoughts and prayer are with Helen and Marc and Doc and the rest of the family as they try to figure out how to keep on going without such a force of nature in their lives. God bless-and godspeed.